All The Students of IGNOU who are pursuing MA English course have to submit Ignou MA English solved assignments of their respective years to complete their courses and the student can download Tutor Marked assignment in English medium from the official website for the session 2017-18. All the guidelines is already mentioned in the Ignou solved assignment that what question they have to write and how much words they can use, For 20 marks questions, student must write answer’s within the mentioned range of 500 words each. For 10 markings question, the word limit should be within 250 words each. The maximum number for every single assignment is 100. The university provide 30% weightage to assignments which means the 30% of this assignment marks obtained by the learners will be added in the final total marks of the course. That is the reason the total number for any course will be of 70% theory and 30% assignment. 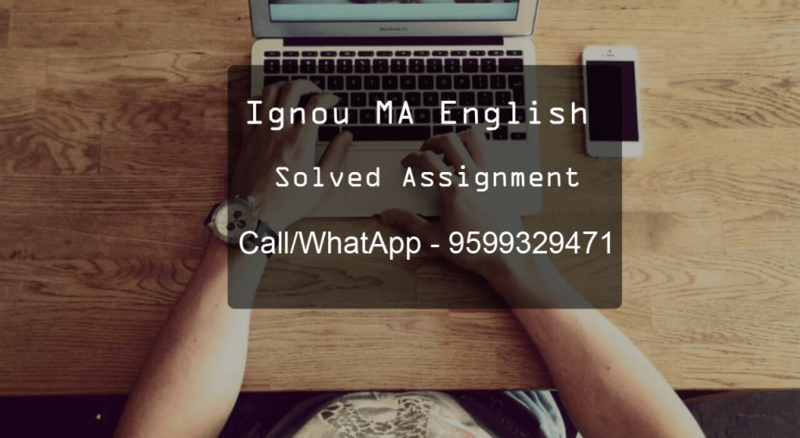 How to Get IGNOU MA English first & second Year Solved Assignments? It is always good and recommended to all the students to solve assignments by themselves, Because it help learner’s to go through complete study material which help them in exam preparation. Feel free to Dial/Whatsapp us if someone needs help and not able to solve the assignment then he may request for Ignou MA English solved assignments 2017-18 for all subjects code which we will provide you in the form of PDF at a very nominal price and if you are looking for Ignou Bcom Solved assignment then check our b.com assignment blog.